Eighteen years ago I became reacquainted with a form of music in India known as bhajan, or devotional song. Having grown up from the age of one in Nepal when my parents moved there as medical doctors in 1970, I had often heard bhajans in the Nepali church and in India where I went later to boarding school. But when I returned to South Asia in 1990 after music college at Berklee in Boston, with the intention of forming a rock music group, I was struck again by the beauty of bhajans and determined to blend their melodies in with the sound of the band. I was fortunate enough to have learned Nepali fluently from childhood, and Hindi was closely related. A foreigner singing fluently in those languages was always a cause for much amusement and delight among the locals, and occasional mocking! But I stuck with it. During those years as a rock guitarist and singer, I also attempted to improve my sitar playing which I had dabbled with at boarding school, and completed a bachelor's degree from a music college in Lucknow. 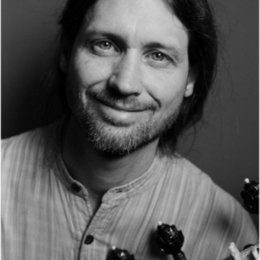 But it was not until Peter Hicks joined me in India in 1998, that I was able to focus completely on sitar while he took over creating arrangements to the bhajans on his acoustic guitar. After our group, Aradhna, was formed in 2000, I returned to the States, lived for a few years in Brooklyn, NY, and then moved up to Toronto where I now live with my wife, Miranda Stone, in Little India.